Night Safari & Zoo Trip!! 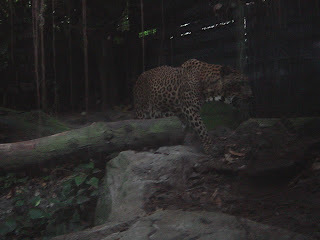 On 9th June 2007, we went to Night Safari. Met up at around 5 plus after Janice lesson that day, took bus 138 all the way there. So excited to go there as it's my very first time going to the Night Safari. So happy to see Janice and Shannon oso, cuz long time no see them le. We chat on te bus on our way there and Shannon took some video of us in order to keep the precious memories. Finally reach there. Took a few photos at the entrance of Night Safari. I bought the tickets den we proceed on. Went in and went to wait for a 'Creatures of the Night' show. However, the sky went dark and it started to rain. All the other people including us have to get back into the shelter and the show for that slot was canceled because of the weather. but the rain does not start us from enjoying ourselves and we carried on with our adventurous hunt in the night. We took the path that led us into the rainforest. With the map in our hands, we went hunting for the nocturnal animals inhabiting 40 hectares of the dense secondary forest, Night Safari. Soon the rain stop and we were still excited in seeing all the animals. There are really lots and lots of species in there till I am not able to name all of them. As it is real dark in the night and nocturnal animals are not used to bright flash, we couldn't take much photos. After walking for quite long hours, we went to take the tram to go round the place. Some of the place is not allowed for walking so some animals are onli being able to see if you take the tram. The animals there in the West Loop of Night Safari are able to walk around, thus onli tram can travel there and not us walking and hunting on our own. haha... After the tram, we finally caught the last show which we missed previously. The show was really amazing. If you have the chance and have not gone there before, really can consider that as an outing. That's all for Night Safari on 9th June. I shall proceed on with our Zoo trip on the following day. On 10th June 2007, we went to the Zoo. Met up at around 10am. This day, we can spent all our time there in the zoo without the need to rush not like Night Safari. However, the zoo is really very big till you need good planning in order to see all single animal in there.. haha...We were more excited and energetic on that day. Perhaps it's cuz we have enough sleep. haha.. We went to see all the animals and among all the animals, the animal that I most like is the White Tiger. They are so nice-looking with their white fur. They are the most rare animals that may extinct soon. For Janice, her favourites are Giraffe and Polar Bear. As for Shannon, his favourite is Elephant... haha...They went photo-shooting with the Orang Utans too.. I was scared of them so didn't take.. hahaha... We spent the whole day from 11am to 6.30pm. Den we went back to Shannon's house to pload the photos that we took... As well as the videos.. haha...Pictures speaks more than words, so you all out there can view the photos and try to get a feel out of them. haha..
Shannon kor, wads in ya mouth? Janice is on a holiday?? Y sian?? Haven start wor..
Hey, wad you 2 doing?? Aren't you scare of me?? Me & Janice on "Jeep"
Shannon & Janice on "Jeep"
What are you pointing at?? Candid shot - What are they doing?? Zoo Sign Board - Nice rite?? Can you spot the snake??? Thats all... Stay tune for more updates!! !